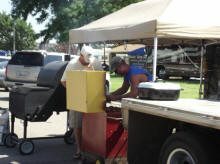 ATTENTION DODGE CITY DAYS BBQ FANS: Are you interested in being a certified judge for our Smokin’ Saddles BBQ Competition? We are now offering a CBJ certification class! Contact the Chamber for more details or use this form to sign up! Over $15,000 awarded in Cash & Prizes?? There are five categories to test all barbeque skills. Judging begins at 11:30 am on Saturday, July 25, 2015. *Sirloin category is now an optional Misc – Anything Goes category and will not count toward Grand Champion. Grand Champion will also receive free entry into the 2016 Contest. In conjunction with The Kansas City Barbeque Society (KCBS), the sanctioned Professional Division of our contest is now designated a “Cup Event” of the Rocky Mountain BBQ Association. 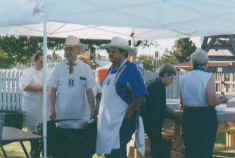 The Rocky Mountain BBQ Association started the Rocky Mountain Cup for several reasons. The mission of the RMBBQA is to help promote barbeque cooking and competitions in the Rocky Mountain region, and the Cup helps achieve this by increasing team attendance at Cup events. The idea behind the Cup is to reward consistency and give bragging rights. The team that wins the Cup is the best barbeque team in huge 7-state area and 100+ team membership base of the Rocky Mountain Region!